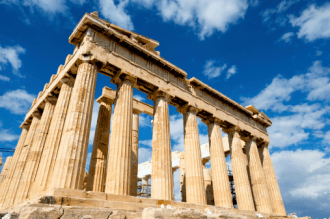 Around 1100 BC, Greece had reached a turning point in its early history. The Minoan Civilization, which has been credited as being the first civilization in Greece, had collapsed. Many historians and archaeologists believe that their collapse was due to the Mycenaeans whom they believe conquered Minoans. This fact has been disputed, and there are those who believe that there could have been other factors involved. The Mycenaean Civilization enjoyed a long period of prosperity. During the Golden Age of Greece, which came long after, the Ancient Greeks celebrated heroes that had been alive during the time of Mycenae. During the height of its civilization, they were formidable. However, they eventually collapsed as well. Part of the reason for this was a series of events that included a memorable battle between the Mycenaeans and the Dorians. One of the places where the Greeks headed was into Asia Minor, which is now part of modern-day Turkey. They established colonies in places such as the island of Kussadasi and Ancient Smyrna, which is now called Izmir in Turkey. While this period of migration had the Greeks moving in many different directions, a large concentration of Greeks relocated to what is referred to as the Ionian Coast. The Greeks that came here ended up forming established communities that were in place for thousands of years. During this time, most parts of Asia Minor were uninhabited, so the Greeks looked to this as a fresh start. As people slowly moved east, the territory of Ionia was established which included 12 major cities. Most of these cities were on the mainland or the coast of Turkey, while two were established on the Greek Islands of Chios and Samos, which to this day, remains part of Greece. 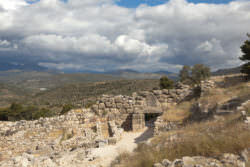 Ionia offered new hope to the Ancient Greeks who were searching for some stability and a fresh start following the fall of Mycenae. 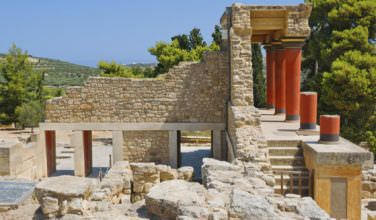 The Mycenaeans had built their empire on old Minoan sites on Crete and on the mainland, but mostly in Southern Greece. In fact the Archeological site of Mycenae was uncovered only 60 miles southeast of Athens. The Ancient Greeks may have ventured a bit north towards what is now Athens and set sail, or just headed east to the coast. If you draw a straight line from area around Athens to the east you’ll hit the coast of Turkey, just south of the island of Chios, which became one of the Ionian Islands. This linear route may have been the exact route the Ancient Greeks took. Besides being known for their aggressive expansion tactics (including violent take overs of the Minoan settlements), the Mycenaeans were trade and commerce visionaries who established strong trade routes throughout the Mediterranean and the Middle East, which included trade with Syria and Egypt. 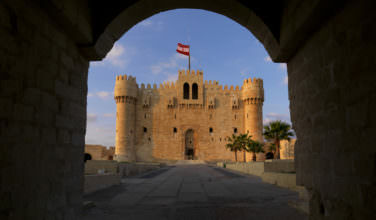 The trade routes and established relationships with the settlements in Syria and Egypt might have also been an incentive for the Greeks to head east, as the trade routes became charted territory. The Greeks had a sense of where they were heading and whom they might run into along the way. The truth is, it is not largely known why the Ancient Greeks started to move beyond their existing geographical borders. The only thing that is certain as that the Greek civilization spread, so did its influence. 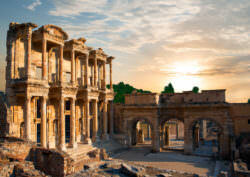 Do You Know About the Library of Alexandria?